Folk-Lore, by Edward Nicholson, 1890. 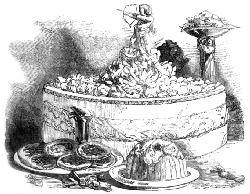 The origin lies in a technique, known from medieval times, in which a pastry case was created separately from its contents. Coarse flour and water were moulded like clay into the shape required and then baked hard. It was inedible in itself but served in the absence of suitable ceramics to hold whatever was being baked, which might be almost anything — meat or fish as well as game. They were called standing pies because the pastry cases stood by themselves. Such constructions were often ornate showpieces at banquets. The cases were usually thrown away after one use, though one source has stated that they were “given to the hounds or to the poor”, which seems hard on the teeth and stomachs of either. The other sort is a “stannin’ pie,” made like a pork pie and often as hard to cut into as a brick. This will keep any length of time, and the housewife finds it handy to offer cold to any chance visitor, if only she can hide it from the lads; but they have as keen a nose for sweet pie as they have for the rum butter we make at a christening and hide from them. Manchester Guardian, 26 Dec. 1903. Yorkshire men and women will know what must surely be a shortened version, stand pie. This is a large pork pie for sharing between a number of people, one that was specially prepared for Christmas. [Pork] pies were a childhood treat — the bigger version, the stand pie, was an essential part of Christmas, complete with home-made piccalilli. The Yorkshire Post, 8 Jun. 2007.